Age 96, of East Lansing, MI, formerly of Hillsdale, MI. She was born January 19, 1923 in Puyallup, WA. Passed from this world March 28, 2019 surrounded by her family. Sis was the owner and broker of CanAm Properties in Hillsdale. 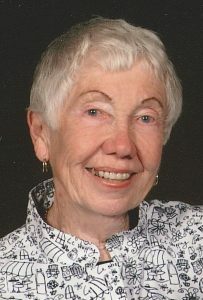 She was an active member the First Presbyterian Church of Hillsdale and the First Presbyterian Church of Okemos following her move to the area in 2003. Sis and her husband, Bill, loved a good adventure, whether it be hiking around Europe, a zip-line in Costa Rica, or kayaking Loch Ness. She is survived by her husband of 68 years, William “Bill” Fritze; children: Randy (Amy) Fritze, Cheryl (Bob Bildner) Fritze, and Scott Fritze; four grandchildren, Jason, Ryan, Ashley (Brandon) and Kali (Andrew); and two great-grandchildren, Ava and Sophie. Sis loved a celebration; a holiday, a birthday, any excuse for a gathering of friends, family, hugs and love. A special thank you to Tender Hearts Personal Care and Great Lakes Hospice for their loving care. To honor and celebrate a life well lived there will be a memorial service held 11:00 a.m. Tuesday, April 16, 2019, at the First Presbyterian Church of Okemos, 2258 Bennett Rd., Okemos, MI 48864. In lieu of flowers memorial donations may be made to First Presbyterian Church of Okemos or Greater Lansing Food Bank. Arrangements are by the Estes-Leadley Greater Lansing Chapel.